Removal of Olu Oguibe, Monument for strangers and refugees, 2017. Concrete. Installation view at Konigsplatz, Kassel, documenta14. Photography by Michael Nast. Courtesy of the artist and KOW, Berlin. In his extensively discussed essay “Of Other Spaces,” Michael Foucault suggests that the present epoch is above all the “epoch of simultaneity: the epoch of juxtaposition, the epoch of the near and the far, of the side-by-side, the epoch of the dispersed.” He asserts that we are in a moment when “our experience of the world is less that of a long life developing through time than that of a network that connects points and intersects its own skein.” The more we experience life through screens, reading — while smelling freshly brewed coffee — about massive catastrophes and injustices occurring many places around the world at once (possibly where we are too), the more apt the aforementioned passage becomes. Even if our more critical minds remind us not to look at the world exclusively through the lens of the Western cannon, and thus not rely on the same authors again and again, in some cases this seems inevitable. “Funnily” and “frighteningly” enough, as I write this text I can see relevant news items as they appear in another open window on my screen: President Recep Tayyip Erdogan bans “foreign” — European for the moment — plays in Turkey. Among the censored writers are Dario Fo, Shakespeare, Chekhov, and Brecht! Does this prohibition really mean that much in the epoch of digital media accessibility? Perhaps not. Yet it is a strong symbolic gesture against planetary patrimony. It is also a gesture that does not come from an anticolonial discourse that prioritizes noncentral voices, but from a popular and “dangerous” nationalist leader. It is exactly this inversion, this kind of relational affinity, that we should be very aware of in our present epoch of the dispersed as described by Foucault. Not because postcolonial rhetoric shares any ideals or beliefs with populist and/or nationalist politics, but because the latter will base their arguments on anti-global and anti-capitalistic efforts as well as the broader debate around cultural difference. Nowadays, unfortunately, it seems that within this long-lasting and valid dialogue on the imposition of a generalized cosmopolitan culture built on Eurocentric foundations, the role of the victim and the victimizer are interchangeable. This is very concerning. At times — and maybe now is one of those times — efforts to forge a counter-discourse to hegemony can themselves become hegemonic. Models of inclusion and exclusion, even if profoundly necessary when formed and adopted, can eventually defeat their own purpose. So, we have continued to ask ourselves: How can the very ideas of liberation and self-determination escape the subjective viewpoint of the “author” that brings them together? Rather than continually articulating, rearticulating, and otherwise fixating on a series of presupposed cultural and historical traits, we should perhaps question anew time and place as they are perpetually shaped. How is the notion of a “common postcolonial heritage” upheld in times of thriving neocolonialism, triggered not only by the global economy but also by the new ultra-right-wing nationalist and authoritative forces that have gained popularity all around the globe? Some weeks ago, at the opening of a solo show by artist Socratis Socratous at the Breeder Gallery in Athens, one of the works captured my attention. 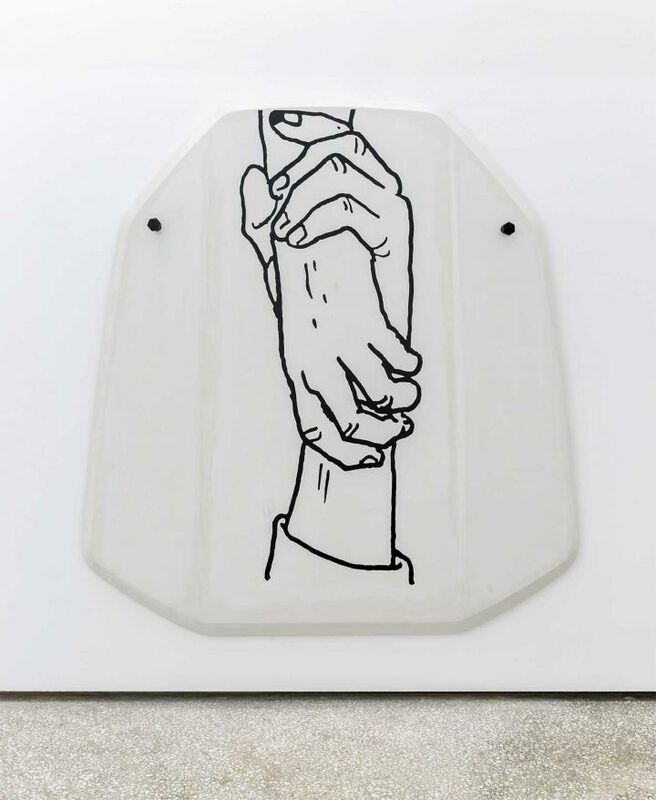 An almost two-dimensional sculptural construction hung on the wall included a blown-up drawing of grabbing hands, borrowed from a lifeguard’s instruction manual. On that occasion the artist explained to me how crucial it can be to hold another person correctly during a rough sea rescue, and how this important life-or-death matter of precise grabbing intrigued him and inspired the piece. In my mind this image connected with the obvious — the refuge crisis, the cruelest of all events of the twenty-first century — but also with the ways we coexist. We have been striving for sovereignty, for recognition, for multiplicity, and yet we shape borders, more and more borders. Our efforts may have had side effects. Involuntarily, we allowed nationalism to flourish as never before since the late 1920s. Maybe, I thought in relation to Socratous’s work, we have been using the wrong means of grabbing and hugging each other. “It is not our differences that divide us. It is our inability to recognize, accept, and celebrate those differences,” urges Audre Lorde. Yet in a world that has been organized by colonial processes it takes effort and time to be able to do so. What seems important is to stay united, with like-minded allies and friends and not just everyone. The point is to jump outside the circle of “killers,” however we can, and to help others too, if possible. But the “killers” are everywhere. “Radical” capitalism’s enforcement of the idea of communities — preplanned communities, one might say — has separated people into specific teams, making it easier to control them. We have to regain continuity and rethink the essence of democracy. At the same time, maybe we have to stop offering our wisdom and knowledge to crypto “oligarchies,” “monarchies,” and any other sort of greed-oriented corrupt system that literally exploits people without limit. They seek our legitimacy, and they provide “help” to our cause when it does not directly affect their “locality.” Where do we stand vis-à-vis such options? How do we navigate the generous support that is offered to us, in the absence of any other support, during times in which we are barely surviving amid the ruins of democracy? Are the consequences of our acts and our synergies in sync with our ethos and our aims? Are we defeating our own purposes? Alliances are always very welcome; yet democracy is an imperative! Humans have died again and again in its pursuit. We should be constantly vigilant. NO, 2019. GRP (Glass Reinforced Plastic), gel-coat color, black tar drawing, iron screw. 221 × 210 × 11 cm. Courtesy The Breeder, Athens. To becoming carnivores in the absence of any other alternative. To serving rulers around the world. And, sometimes blinded by vanity, in search our own discrete position, to writing about what divides us instead of what brings us together. The necessary yet uncontrollable repetition of terms such as decolonization, supremacy, reinstitution, repatriation, and return in currently circulating texts makes me skeptical in various ways. For example, a case that is familiar to me is the discussion on the repatriation of the Greek marbles — a case that has once again become prominent, and very rightly so. They are plenty of texts online and printed in art publications that discuss the situation and demand their return. Genius loci matters; economies matter too. Yet, in all these texts, I rarely if ever read about the miscomprehension — or more accurately the misappropriation — of ancient Greek culture and provenance. Yes, understood, we want our marbles back. But who are we? This question should also matter! What happened to our golden, fuchsia, and vivid blue temple with its striped Doric columns, and to the red-lipped caryatids who held its roof on their shoulders? Why does color escape the discussion of the repatriation of the Greek marbles? Might it stain the “invented” pure white glory that made the marbles so celebrated and precious? Restitution is a definite right of each culture, nation, and citizen. Yet the dismantling of a hypercolonial world history also feels more necessary than ever. I dare say that the discussion of the return is as important as the return itself. Perhaps this unlearning process might lead to a more democratic, all-inclusive togetherness. Following the restitution of historical facts, it is even possible that Western museums will voluntarily discharge their trophies back to their “homes” (laughs). What are “historical monuments” if not vivid proofs of and memorials to human struggles for a fair manner of living? Why we are exclusively interested — even if this is also extremely important — in which nation they belong to? The passionate focus on repatriation overshadows other parallel histories and unintentionally strengthens nationalist causes. Maybe the fictionalized white purity of the ancient ruins as the cradle of Western civilization is a one of the proto-campaigns of white supremacy. This issue is as worthy of our attention as reinstitution. In fact, the two issues go together. Olu Oguibe, Monument for strangers and refugees, 2017. Concrete. Installation view at Konigsplatz, Kassel, documenta14. Photography by Michael Nast. Courtesy of the artist and KOW, Berlin. “The current avalanche of pluralist awareness suggests that many societies are perhaps too preoccupied with the daunting project of self-interrogation and re-narration within their own borders to extend this critical disposition to debates on internationalism.” Thus argued Olu Oguibe back in the early 1990s, in a conference and publication organized by INIVA and edited by Rasheed Araeen and Jean Fisher. “This is the fundamental problem of emergent debates, namely that by failing to question a given internationalism and yet predicating themselves on it, they implicitly share in the dismissal of longstanding traditions of internationalist exchange between peoples and cultures outside the West.” But are we ready to host the stranger? Any “we” and any “stranger,” that is? Can we understand that now, maybe more than ever, we should reexamine the West and its power, learn to comprehend it anew as just one directional perspective, a subjective point of view within someone’s orientation, and stop buying into it as the all-shaping cannon of thought and action? One of the most memorable works of documenta 14 was (and will be) the Monument to Strangers and Refugees by Olu Oguibe. Besides its strong sculptural presence and its conceptual magnitude, the work will always be remembered for its haunting history. 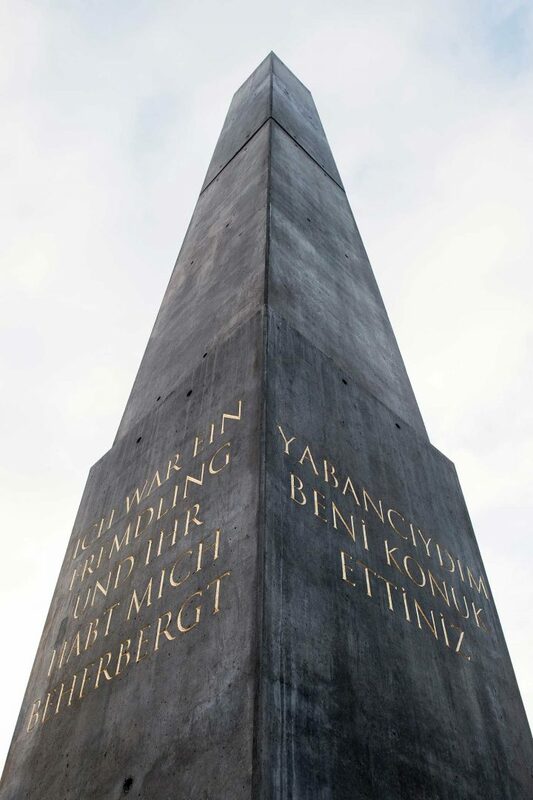 Designed as a site-specific piece for Königsplatz, a pedestrian square in the city center, the work reads: “I was a stranger and you took me in.” The verse is from Matthew 25:35, and it is inscribed in gold letters in German, English, Arabic, and Turkish. According to Oguibe, his obelisk was intended as a “call to action,” bringing to light conditions that millions of refugees have faced. Yet the work was politicized by Kassel’s City Council under pressure from the right-wing anti-immigrant party Alternative for Germany (AfD). The term “degenerate art,” attributed to the work, was once again heard during meetings held in the same city where the very first destructive acts of Kristallnacht took place. The public monument was offered for sale to the city so as to remain permanent, as other documenta works had in the past. Following negotiations (the artist offered a huge reduction in price), a final agreement took place. Yet, in a meeting on September 24, 2018, which was to decide the fate of the obelisk, the City Council opted to remove the statue indefinitely, rejecting earlier proposals offered to Oguibe to place the work in Holländischer Platz — a less central location near a local university. Prior to a final conclusion, the monument was removed on October 3, 2018, on Germany’s national holiday commemorating reunification. This was a violent and authoritative symbolic gesture. And yet, as the news spread via national and international media outlets, the obelisk’s removal would soon be protected by the masses. The monument will apparently return to the public space of Kassel in another central location, though not the square for which it was designed. Its message was carried across neighborhoods, nations, and communities, and it will be carried across generations as well. It cannot be undone. It is as if Oguibe knew what his work would provoke, but nevertheless made the effort, not only to make political hypocrisy apparent but also to push the boundaries further for a better future. The lyrics of a Momus song titled “Erostratus” go like this: “On the night of July 21st, 356 BC / I, Erostratus, burned to the ground / One of the wonders of the world / The fabulous temple of Artemis / Here in the great port of Ephesus // I did it to get famous / To thwart me / The authorities stupidly forbade my name / On pain of death / Ever to be mentioned again // The fools! That was my guarantee/ Of immortality / Some tool in the twenty-first century / Even as we speak is singing about me! // And in your day I have many imitators and admirers / My name endures, said Sartre / ‘Like a black diamond.’” These lyrics are not fictional. They are based on ancient Greek history. As for Erostratus, it is still uncertain who exactly he was. He may have been someone of low social standing, a non-Ephesian or a slave. No matter who he was, I like to think of him as an anarchic, proto-libertarian spirit who, in his effort to disrupt the construction of an invented history — what we would today call fake news — went so far as to burn a temple. Let’s hope there is no need for more temples to be burned for the purpose of unlearning and recomposing official history. In times like these, in which we are about to lose all our rights, our resources, and eventually our freedom, we should be very observant of every detail that is happening around us, and very cautious with all our acts. Artemis Potamianou, All in All, 2019. Carpet. Photography by Chris Doulgeris. Courtesy of Enia Gallery, Athens. In terms of the best of the worse, the daily routine is no longer the daily routine we knew; the city is no longer the city we knew; the politics are not the politics we recognize; our belongings do not belong to us anymore; public space does not belong to us either, and even private space is negotiable, if there still is one. We are an entity in transit, in which nothing is familiar anymore and everything is banal. We are living through a rapture. As we are experiencing this inevitable change, in which everything is in flux, space loses its shape and transforms into nothingness, an immaterial place: the space for the impossible. Can we transform this uncontrollable oscillation from here to there and elsewhere within a space where “everything” might — again, or at once — be “possible”? From where do we start, if we want to open up a possibility for a discursive change to occur? The maze shouldn’t be the problem. Closed doors, absolute points of view, and absolute solutions are the problem. What is topos and what is time in the brave new globalized and ultra-linked transworld? Navigating the time and space that lie between two poles of any kind involves a precarious route that might paradoxically lead to a productive outcome full of possibility and hope. With hindsight, it could be a dynamic transition. In his book Temps de Crises (Times of Crisis) Michel Serres describes this place in the following manner: When a brave swimmer swims a wild river or rough sea passage, the route contains three passages. As long as the swimmer maintains contact with the point of departure, or when the swimmer sees the point of arrival from far away, the swimmer inhabits the object of desire. However, somewhere in the middle of the course, the swimmer encounters a very decisive and at the same time painful experience. Far away from the two shores, the swimmer goes through a neutral and gray territory, a time of transition that is not one place or the other but both of them at once. Distressed and trying to find balance in this moment, the swimmer encounters an undiscovered place, one that does not exist in any map and which no traveler has described before. “Homecoming” or “permanent exile” can no longer be the only possible sides to the debate. Maybe a set of new commonalities may be more appropriate and also more inclusive. What about a third space — or a series of third spaces lying between centers and peripheries — where people meet to imagine alternative ways of being in the world? A place “between places,” a correlation of space, form, and politics consisting of various interrelated sovereignties? A place that remains constantly open to unexpected dialogues among neighborhoods, cities, regions, associations, and approaches? What about a common narrative en chemin, fluid and constantly open to further questioning and constructive complications along the way? A narrative that has as much to do with the people and the places we interact with along “the trip of life” as with the awareness of our own selves. Who are we really, and from which vantage point can we perceive our surroundings? Perhaps the present “notion of public space” as coined by Nikos Papastergiadis — be it a symbolic pole, a biennial like the one that coincides with this issue, a journal, or a conference — is revealing itself as a crucial meeting point for cultural and artistic debate, a place “between places,” a correlation of space, form, and politics. The purpose is to find ways of becoming advocates of a new era of political life (political after polis) that is yet to be seen. An era that offers a genuine possibility for a democracy that includes the citizen and the cityless cosmopolitan, the local and the immigrant, the expat and the refugee, through new associations that are being defined horizontally and not from upside-down or downside up. Such meaningful words and ideas have been helping to change these processes of malpractice around the world. Both Zaya and Bhabha were recently in the Emirates as part of the jury for the Sharjah Biennial Prize. When I first heard this I felt a slight pinch in my soul, but then I thought: What are the other alternatives? I am sure they found a way to deal with this sensitive situation in the most ethical and fruitful manner. MARINA FOKIDIS is a curator and writer based in Athens. In 2014 she was appointed Head of the Artistic Office, Athens and curatorial advisor for documenta 14. She is Artistic director of Kunsthalle Athena and South Magazine. Michael Foucault, “Of Other Spaces,” Politics, Poetics, Documenta X, Berlin: Hatje Cantz, 1997, p. 274. The Invisible Committee, Now, Semiotext(e), 2017. Rasheed Araeen and Jean Fisher, Global Visions: Towards a New Internationalism in the Visual Arts, Third Text Publications, 1994. Kristallnacht was a pogrom against Jews throughout Nazi Germany on November 9–10, 1938, carried out by SA paramilitary forces and civilians. German authorities looked on without intervening. The name “Kristallnacht” comes from the shards of broken glass that littered the streets after the windows of Jewish-owned stores, buildings, and synagogues were smashed. The first destructions were reported in Kassel, two days before the major events. Michel Serres, Temps de Crises, France: Edition Les Pommier, 2009. “Southern Comforts, Tropical Baroque, Pirate Thinking,” in South as State of Mind 1, Summer/Fall 2012. “Of Mimicry and Man: The Ambivalence of Colonial Discourse,” in October 28 (Spring 1984); reprinted as The Location of Culture, Chapter 4, 1994.